What about those great white sharks of the Mediterranean? UTRECHT (THE NETHERLANDS)- Not many of the millions of sunseekers that flock the Mediterranean coasts of France, Spain, Italy, Greece, Turkey, Croacia every year, realize that they share the waters with the most feared of all sharks: the great white. Yes this awesome apex predator does inhabit the clear blue waters of the seas between Europe and Africa. Although now near extinct, according to IUCN reports, once in a while great white sharks pop up and show their faces to fishermen, divers or spearfishers in the Mediterranean. One of the last sightings was in june 2015, when amateur fishermen of Sicily saw something moving in the water, about ten miles south of Porto Empedocle. After realizing it wasn’t a dolphin, the white shark was already moving towards their boat. Earlier that year a great white was spotted off the shores of party-town Magaluf in Mallorca, though this was not confirmed. For long it was believed that the great whites came in from the Atlantic Ocean, following the migration of Bluefin tuna through the Strait of Gibraltar. In the Matanzas, the traditional way of catching tuna off Sicily and Sardinia, great whites have been found in the nets. Another theory is the so-called Lessepsian migration, where sharks have come in through the Suez-canal from the Red Sea. In July 2008 fishermen of the town of the Turkish town of Altinoluk contacted marine scientists about two newborn great white sharks they caught. A research team from the Bosphorus and the Istanbul University collaborated with an international team of shark scientists and made a genetic analysis on the tissue taken from the pups. And they came up with a whole new theory: they are born here. The question if great whites are endemic to the Mediterranean has always baffled scientists. 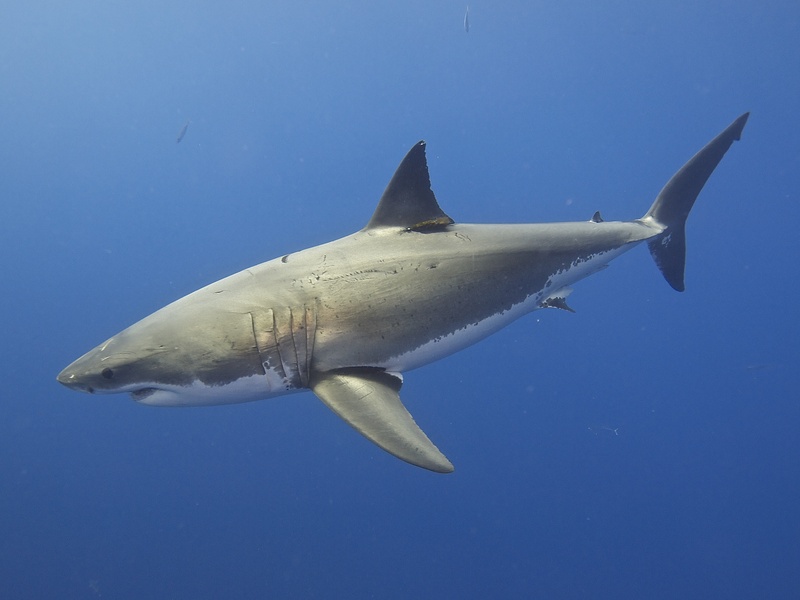 Where it was previously assumed that the great whites in the Mediterranean were most closely related to their nearby cousins in the Atlantic Ocean, following the schools of bluefin tuna migrate through the Strait of Gibraltar, a few years ago the researchers proved otherwise. Great white. Photo: Flickr Creative Commons, Elias Levy. Through examination of the several groups of sharks’ mitochondrial DNA – genetic material passed through the maternal line that is particularly suited to tracing lineages-, the team found that the Mediterranean sharks were very different to the Atlantic group and more like sharks from Australia and New Zealand. The few differences between the Australian and Mediterranean sharks show that the sharks parted ways some 450,000 years ago, a time between ice ages that would have seen many effects of a changing climate. The researchers had a hypothesis that warm currents drew the sharks north. After a considerable long way, the warmth ran out, and the first place to turn east were the Straits of Gibraltar. “It’s not too much of a stretch to imagine the odd one might indeed do a ‘wrong turn’ and make this kind of migration”, Dr. Noble, the leading researcher told BBC News. On July 6th 2011, fishermen of Altınoluk caught another great white pup and this time it was alive. The fishermen did a great job of documenting this extremely rare and endangered specimen. See the video below. It made biologists wonder whether certain locations in the Mediterranean may serve as a nursery for great white sharks. Females may prefer to give birth to their young in places where adult population is minimal so that their pups find refuge. Otherwise the young sharks would be eaten by other adults. One location that is thought to be such a nursery is the Sicilian channel, near the Italian island of Lampedusa. Here both pregnant females and newly born great whites have been reported. With three pups caught in trammel nets for two consecutive summers Altınoluk must also be marked on the map as a nursery for the great white. Ecologically, the great whites don’t have a great abundance of food in the Mediterranean like they do in other parts of the world, such as California and South Africa. The overfishing of the Mediterranean Bluefin tuna has not helped much. The Mediterranean monk seal (Monachus monachus) is now an endangered species with a small restricted population in the Eastern Mediterranean. An adult resident population of great whites is bound to have a low density. And so great white sightings have been quite rare in the Mediterranean. 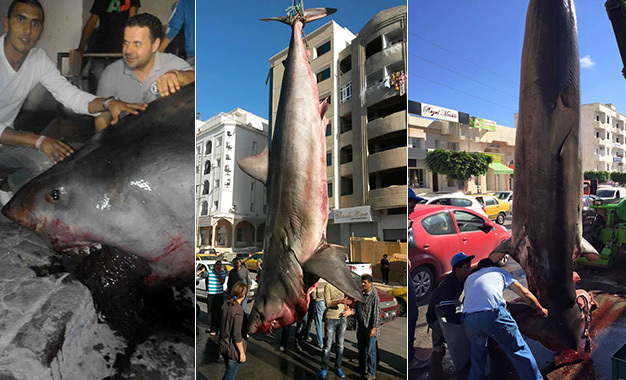 Great white shark shown in Sousse, Tunisia. Photo: Kapitalis. Yet, they are out there, as was proven once again by Tunisian fishermen in 2015 from the town of Sousse. They caught a huge great white shark, weighing about 4,400 pounds. And the few fatal shark attacks in the Mediterranean can almost all be accounted for by great whites, according to the International Shark Attack File. The last recorded attack was seven years ago off the coast of Malta. A windsurfer was attacked by a 3 m shark who eventually just bit his sail. There was no injury. In October 2008 a 43-year old spearfishermen was attacked in the waters around Vis Island in Smokvina Bay, Dalmatian Coast (Croacia) by a 5 m long great white. The shark bit him in the leg, and Pecek lived to tell the tale. The Adriatic coastline of Croacia seems to be somewhat of a hotspot for great white attacks. In the ‘70’s of the previous century the Dalmatian Coast saw four recorded unprovoked attacks by great white sharks, of which three were fatal. In the sixties there were two fatal attacks, as well as in the fifties. In this decade Greece saw four fatal and one non-fatal attacks by great whites as well. Also in Malta a swimmer died after being attacked by a great white, and in the waters off Budva, Montenegro a man died after being attacked by a 6.5m large white shark. In the sixties there were also attacks in Turkey. The ‘80’s saw more attacks in the Mediterranean. Italy had 6 attacks in both sides of the peninsula. One attack was fatal. 47-year old Luciano Costanzo was floating on the surface after a scuba dive when a 6-m great white grabbed him. But great whites in the Mediterranean remain somewhat a mystery. In one of the most overfished seas in the world, there are still sharks that seem to avoid the nets and seek out quiet places to give birth to juvenile sharks. Would you wish to see a great white as a diver though, you’d better take your chances cage diving in South Africa, California or Australia. 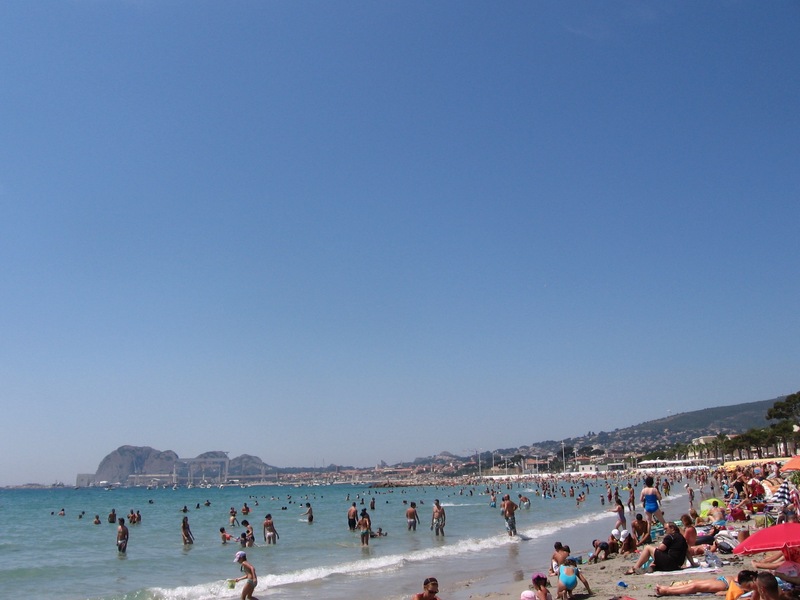 Busy beaches on the Mediterranean Sea. La Ciotat, southern France. Photo: Pieter Verbeek.